There is 60 miles of passenger railroad in San Diego County from the Orange County border to the Santa Fe Depot in downtown San Diego. Right now just over half of this 60 miles is doubled tracked. San Diego County is planning to spend a billion dollars over the next 20 years to double track roughly 97 percent of this railroad in the county. This is the result of public demand 3 years ago when planning began to rebuild and widen the I-5 in north San Diego County. The public wanted more rail service and much less widening of the freeway. So now freeway improvements, double tracking and wetlands restoration are all part of the same project. Early in 2014 two projects are coming to completion. A new mile of double tracking is now in place in Sorrento Valley south of the Sorrento Valley Coaster Station. The long awaited new bridge over the Santa Margarita River is now in use and soon the second track on it will be connected to existing double tracking on both sides of the bridge. 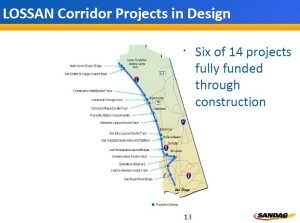 The next big project now under construction is 5.8 miles of double track also in Camp Pendleton from Los Pulgas to San Onofre. The first 4.2 miles of this project is funded and underway. The second 1.6 miles is awaiting funding. When funding is secured the 5.8 miles of double track is expected to be finished by the end of 2015. Another mile of double track is planned north of the Sorrento Valley Coaster Station in San Diego through the Los Penasquitos Lagoon. This will include replacing 4 existing single track wooden bridges with new double tracked concrete bridges. Many of the rail bridges in San Diego County are old wooden single track bridges which are expensive to maintain and near the end of their economic life. San Diego has several rivers and lagoons which are ecologically sensitive areas which construction on them requires a great deal of planning. The goal in San Diego County is to replace these old bridges with double tracked concrete ones. These new bridges will have lower maintenance costs and will be built higher to better survive future flooding. This 1 mile of new double track connecting to the siding for the Sorrento Valley Coaster will be added to the just finished mile of double tracking on the other side of the siding headed south. 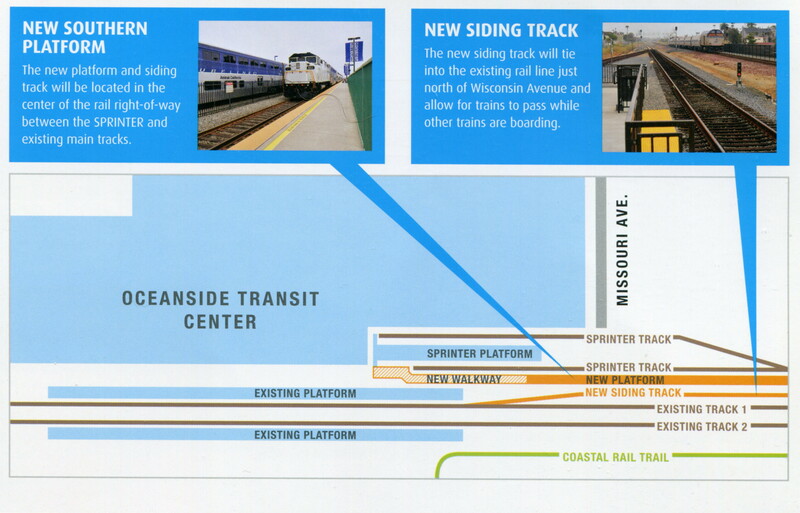 Planned to start construction in 2015 will be a third passenger track and platform at Oceanside. This will allow Coaster and Metrolink trains that terminate in Oceanside to park there while keeping the double track mainline clear. This will increase the track capacity around the station and for San Diego County. Near term there are plans to add more service between San Diego and Orange Counties. This will include extending some existing Metrolink trains to San Diego and Coaster trains to Fullerton. 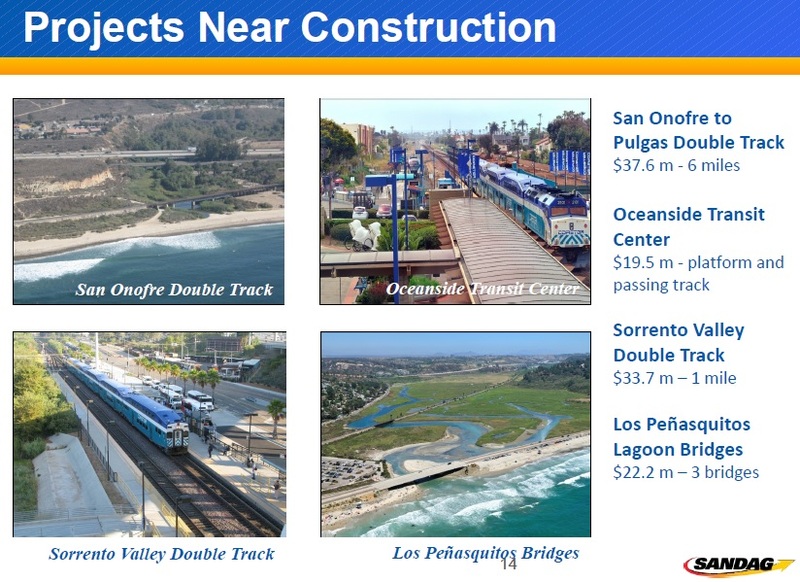 There is a major travel market between San Diego and Orange County which is not served by existing rail service.The track improvements being built will make possible the expanded services. 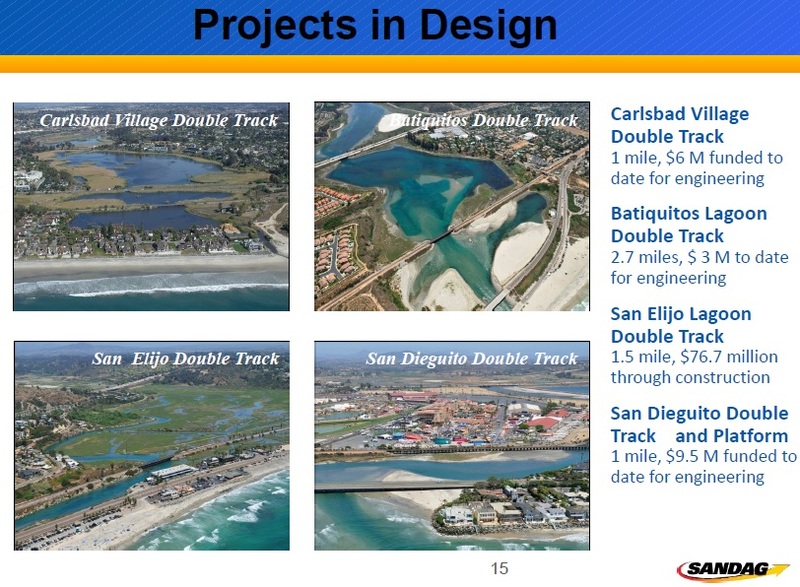 Planned for completion in 2017 will be 1.5 miles of new double track through the San Elijo Lagoon between Cardiff by the Sea and Solana Beach. 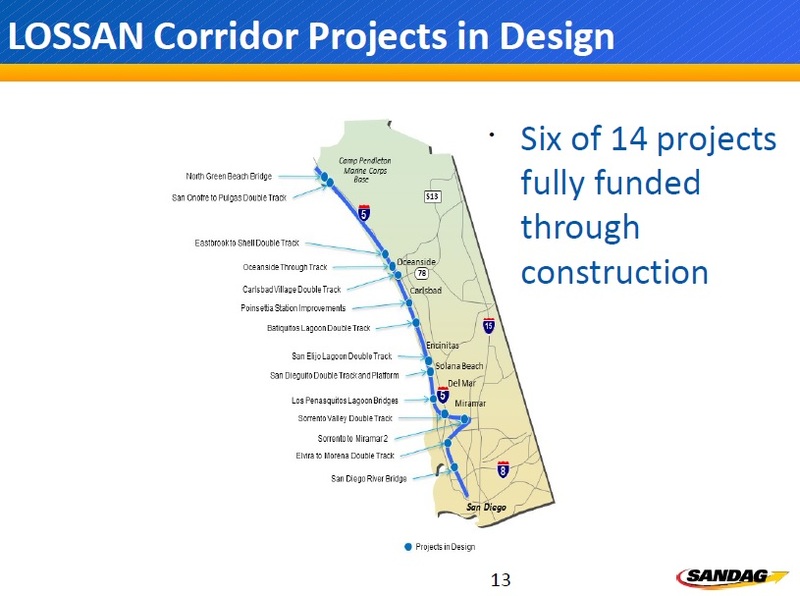 This will connect with existing double track south of the Encinitas Coaster Station and double track in Solana Beach. This will give 4 miles of continuous double tracking. This will replace a 60 year old wooden trestle bridge and the work include restoration of the Lagoon. There are plans to build a new double tracked bridge over the San Luis Rey River at the north end of Oceanside by 2020. 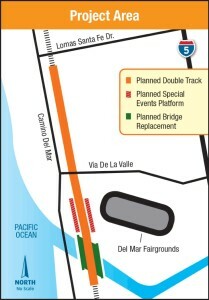 This will eliminate the last segment of single track in Oceanside. It will also provide continuous double tracking from Camp Pendleton though Oceanside.South of Oceanside plans to double track the Buena Vista Lagoon and Carlsbad Village Coaster Station are not planned before 2030. Planning is ongoing to replace a 96 year old wooden bridge over the San Dieguito River with a double tracked concrete one. This is next to the San Diego County Fair Grounds. Part of this project will include construction of platforms to serve events at the Fair Grounds. 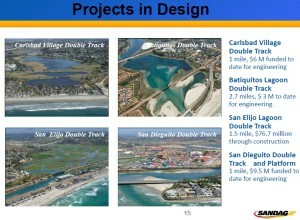 This double tracking would connect the existing double track in Solana Beach with the Del Mar siding. There is no date yet given when this project will be started or completed. One of the biggest gaps in double tracking in San Diego County is over Miramar Hill. This is 2 miles of slow running with many curves in the canyon area between Sorrento Valley and Miramar Blvd. Building double track on these 2 miles will connect with existing double track creating 13 miles of continuous double tracking. Planning is ongoing to build a new double track alignment which will be straighter and faster than the current alignment. The estimates for this project is $99 million dollars and a date completion has yet to be set. Also in the works is a plan to build a transportation center in Camp Pendleton. This will include a station for Coaster trains. Current planning for this transportation center is to place it in Stewart Mesa near the Maintenance Facility for Coaster and Metrolink. This area is now open land but the Marine Corps are planning on major construction at the site in the near future. No date for opening of this transportation center has been given. Camp Pendleton is a major employer in northern San Diego County and is a major traffic generator as well as source of traffic congestion. 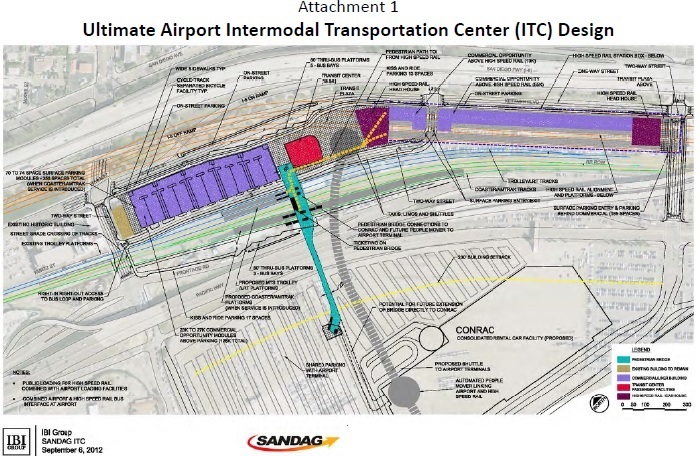 There are plans by 2030 to build a $165 million Intermodal Transit Center (ITC) including San Diego Trolley, Coaster, Amtrak and High Speed Rail at the San Diego Airport. This will be built at the east end of the airport which is next to the railroad tracks and I-5 freeway. The long term plan is for all passengers to arrive at the airport at the east end by 2030 by car and transit. From there passengers will take a future people mover under the runway to the terminals. This is part of construction going on now at the east end of the airport of the Consolidated Car Rental Facility (CONRAC). CONRAC is expected to be finished by 2015 which will include a road in the airport for shuttle buses carrying rental car passenger to CONRAC to pick up rental cars, or to get to the airport after dropping them off. The point is to relieve traffic congestion on the surface streets around the airport. 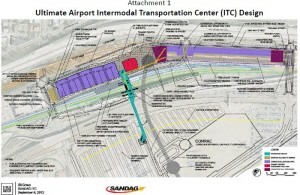 By 2015 it is planned to connect the San Diego Trolley to the airport with regular shuttle bus service on the airport road for CONRAC. There are plans to build a pedestrian bridge between the airport and Washington St. Trolley Station which will be part of the future ITC. However funding for the ITC isn’t expected before 2017. In the interim shuttle buses may be used to carry Trolley passengers to the airport at the station until the bridge can be built. For Coaster passengers this would mean transferring at Old Town to the Trolley the short distance to Washington Street and then connect to the Shuttle Buses. A better solution would be to extend Shuttle Bus service to Old Town for Coaster and other passengers. In the future for Coaster Trains to serve the airport will require more frequencies. The current schedule of the Coaster doesn’t have service to San Diego before 6 AM or leaving San Diego after 7 PM. But the airport is often busy by 5 AM and still busy up to or after 10 PM. 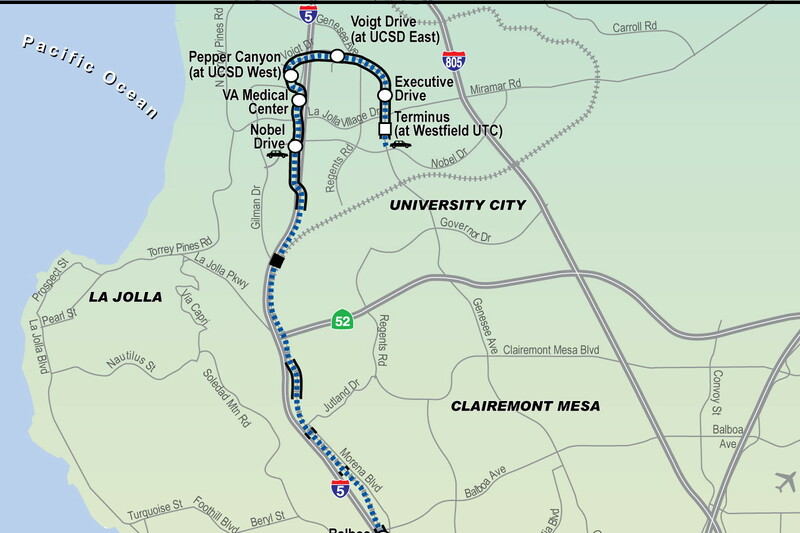 In 2015 the San Diego Trolley is planning to start construction of a long awaited extension north of Old Town to UCSD and University Towne Centre. (UTC). Much of this extension will share right of way with the Coaster. However there are no plans for a joint station north of Old Town. Years ago there was a plan to build a Coaster Station near UTC with connections to UTC and UCSD with a Rapid Bus service in the region. However funding for this station was stripped to build the Rapid Bus service which is now running. The closest point for a joint Trolley/Coaster Station is at Gilman Drive though the Trolley is not planning a station there. Current maps for the Trolley extension show a possible undercrossing for a future Trolley extension at Gilman Drive. No explanation was given to where this extension would go. It is a disservice not to have connections between the Trolley and Coaster for UTC and UCSD. This might be corrected in the long term with a billion dollar plus tunnel to shorten the Coaster route with a station at UTC connecting with the Trolley. 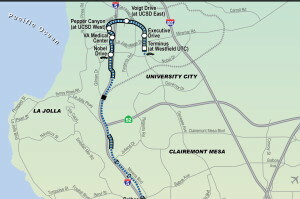 This is cropped graphic showing the planned extension of the Trolley to UCSD/UTC. Also seen are the tracks used by the Coaster and Surfliners. Caltrans has proposed for some time building a maintenance facility for Surfliner trains south of San Diego at National City. This is the original end of the line for the Santa Fe in San Diego and still sees harbor freight traffic. If this were built it could also be used for light maintenance and overnight storage of Coaster trains. Extending Coaster service to National City would provide faster connections on the Trolley by avoiding the slow street running in downtown San Diego. There are plans to add a new Coaster Station downtown, south of the Santa Fe Depot serving he Convention Center and PETCO Park baseball stadium . There are plans as well on the LOSSAN Corridor between San Diego, Los Angeles and Santa Barbara to run both local and express trains. One way to do this will be to reduce stops on the Surfliner Trains and connect them with sweep trains on the Coaster and Metrolink. This is a common practice with many rail passenger services. The way this would work is a Coaster train making all stops would run north ahead of a Surfliner Train. 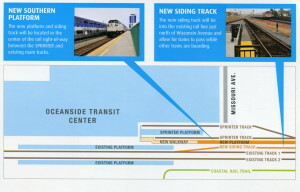 At Oceanside on the future third track it would terminate just before the northbound Surfliner arrived. This would allow passengers to transfer from the all Coaster stop train to the express Surfliner. Southbound the Coaster would wait at the third track until the Southbound Surfliner had left and its passengers had transferred to it. Then the Coaster would make all stops to San Diego.